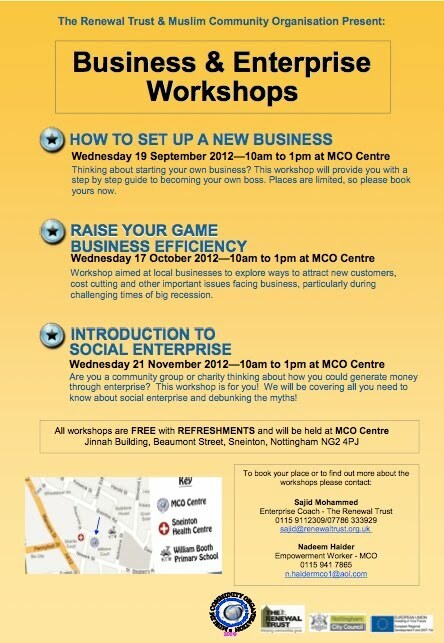 The Renewal Trust and the Sneinton-based Muslim Community Organisation have put together a programme of workshops to help you set up a new business, raise your business game, and find out about Social Enterprise. Times are hard in our economy but there are still opportunities for new businesses and ways in which existing ones can learn to cope and adapt. Community groups and charities might but thinking about innovative ways to generate money through enterprise without compromising their core 'non profit' values. Where ever you are coming from in the Sneinton business community, a start up, existing business or non-profit, this series of workshops will help you to thrive and survive.